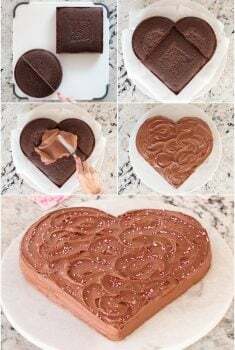 These Easy Decorated Valentine Cookies are not only delicious and look like they come from a fine bake-shop, but the dough recipe is one-bowl and no-mixer! 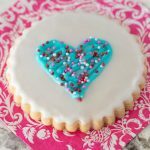 If you’re like me; not a fancy cookie decorator, these Easy Decorated Valentine Cookies will make you look like one! And I’m going to show you exactly how to pull off this little confectionary magic trick. Have you ever noticed that the prettiest cookies aren’t always the most delicious? I’ve purchased beautiful cookies from fancy bakeries and have been so disappointed with the first bite. A cookie that tastes like cardboard with flavorless icing – and for a crazy expensive price! 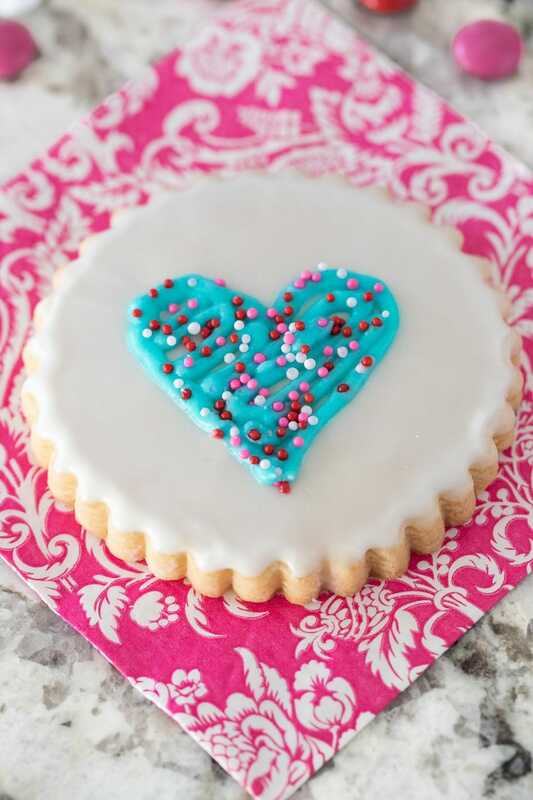 You won’t find that problem with these Easy Decorated Valentine Cookies. The buttery-crisp shortbread is melt-in-your-mouth delicious and the simple powdered sugar icing can take on a myriad of flavors. I’ve done almond, lemon, raspberry, mint, orange and vanilla bean – with just a half teaspoon of extract. One thing to note, be sure to use a pure extract, not one with artificial ingredients for the best flavor. The cookies are modeled after my Christmas Shortbread Cookies and are simple to put together. The dough comes together easily with just a bowl and a sturdy spatula or wooden spoon. Yes, it’s a wonderful one-bowl, no-mixer recipe! The dough does not need to be chilled initially, just flour your work surface and rolling pin and you’ll be ready to go. I like to use an adjustable rolling pin to roll my cookies to a nice even thickness. The one pictured below is a dream, since it can be adjusted to four different accurate heights by simple unscrewing the green handles on the ends. 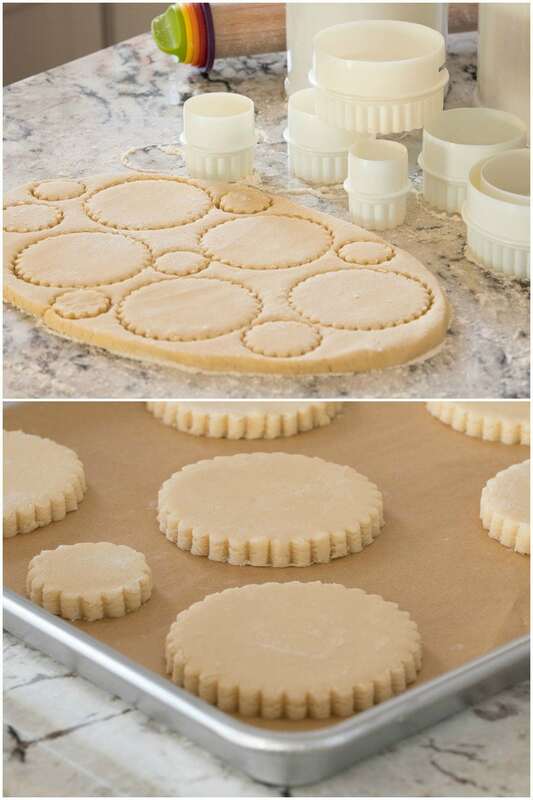 I used a fluted cookie cutter to make my cookies, but you could also use a simple round cutter. I really like this fluted cookie cutter set. It comes with nine fluted cutters and nice little acrylic case to store them in. When I make cutout cookies, I like to make a few different sizes for different size appetites. Being able to use a few different sizes also helps use up the scraps of dough, so I don’t have to re-roll so many times. The decorating technique is not difficult. 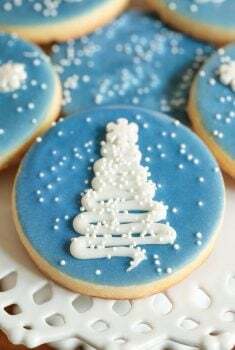 Dip the baked cookies in a simple powdered sugar icing and allow the icing to dry. Then pipe a simple heart and fill it in with back and forth lines. The finishing touch is a quick sprinkle of nonpareils and you’re done! 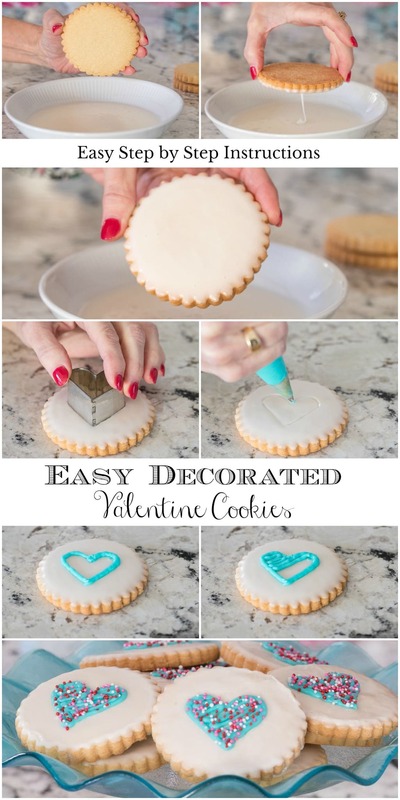 See why I call them Easy Decorated Valentine Cookies? You can mix up both the dipping icing and the piping icing in bowls without a mixer. For the piping, you’ll need a small decorating tip (I use a Wilton #5) and a decorating bag. I love these inexpensive but sturdy decorating bags. They come in a flat box so they’re easy to store and they’ll last forever. Oh, one last thing! 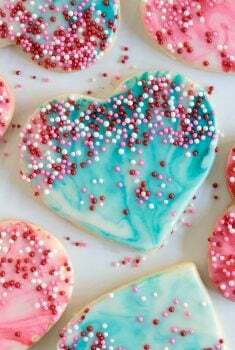 Making these Easy Decorated Valentine Cookies is much more fun if you have a sweet little friend to help you. 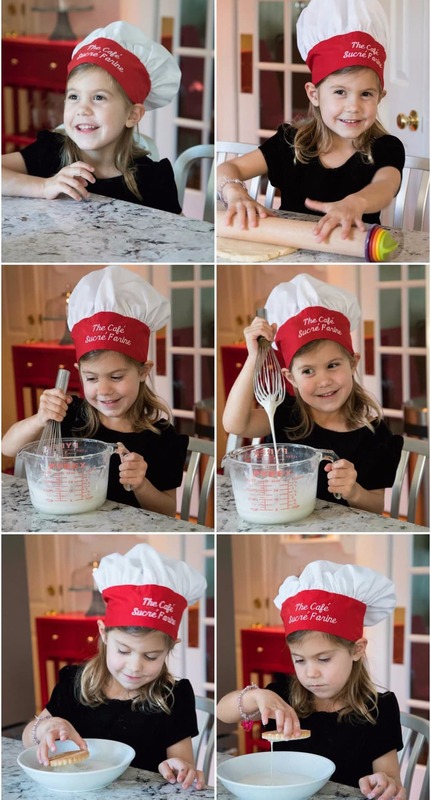 Our granddaughter, Emmy was with us last week and Papa (Scott) had fun catching some shots of her rolling the dough and decorating the cookies. Her little mantra when she’s helping in the kitchen is, “Cooking makes me happy!”. Me too! I guess she got it honestly. Don’t roll the cookies too thin if you’re going to ice them, as they won’t be sturdy enough for the icing technique. I used the rolling pin mentioned above in the post to roll my cookies to 3/8-inch. You can also use 3/8-inch wooden dowels on either side of a regular rolling pin to achieve a nice even dough. 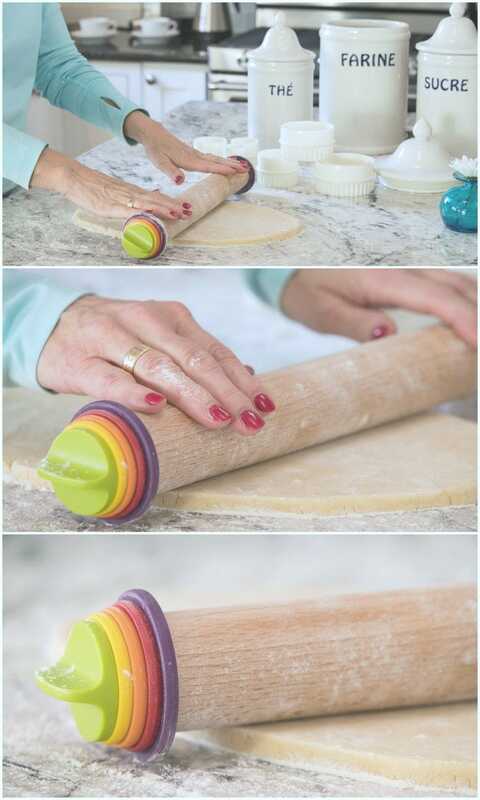 If you enjoy baking with kids, there’s an adjustable rolling pin available that’s just their size! Allow enough time for the unbaked cut out cookies to chill in the refrigerator. You want to cool them at least an hour. If it’s longer they’ll be fine. I’ve left my unbaked cookies in the fridge for as long as 24 hours. 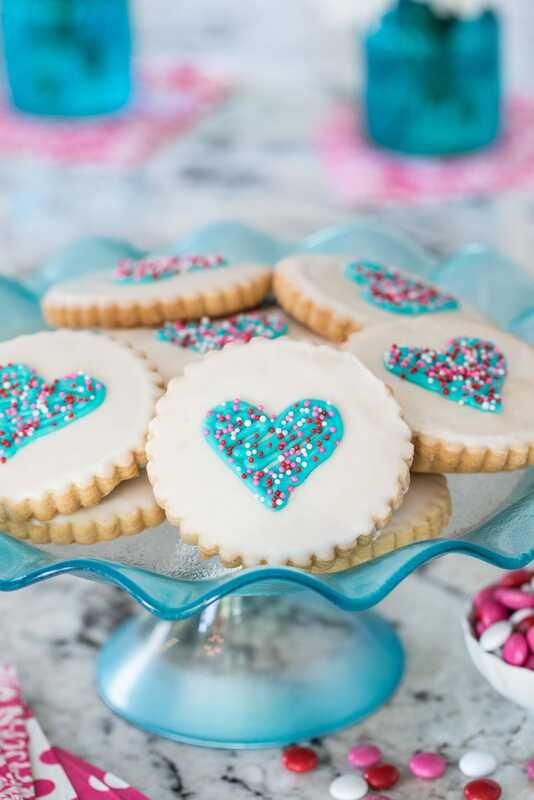 There are lots of wonderful varieties of pure extracts available, so you can switch out the flavor of these Easy Decorated Valentine Cookies to just about anything flavor you might fancy. I’ve used almond, lemon, raspberry, mint, orange and vanilla bean extracts with delicious results. If your dough seems to stick to the counter or to the rolling pin, just flour the counter and rolling pin with some extra flour. Roll the dough ball around in the flour, so it’s coated on all sides and lift up the edges to scoot a little flour under the dough as you roll. If you’re not using a mixer (which I usually don’t), the butter needs to be very soft when mixing up these cookies. That can be difficult during the colder months, even if you let the butter sit out for hours. A short stint in the microwave on power level 10 (10%) works like magic to soften butter. You’ll need to experiment a bit with your microwave though, as they’re all different. Start with 20 or 30-second increments at power level 10 until you learn how long your microwave will take to get the butter nice and soft, but not melted. 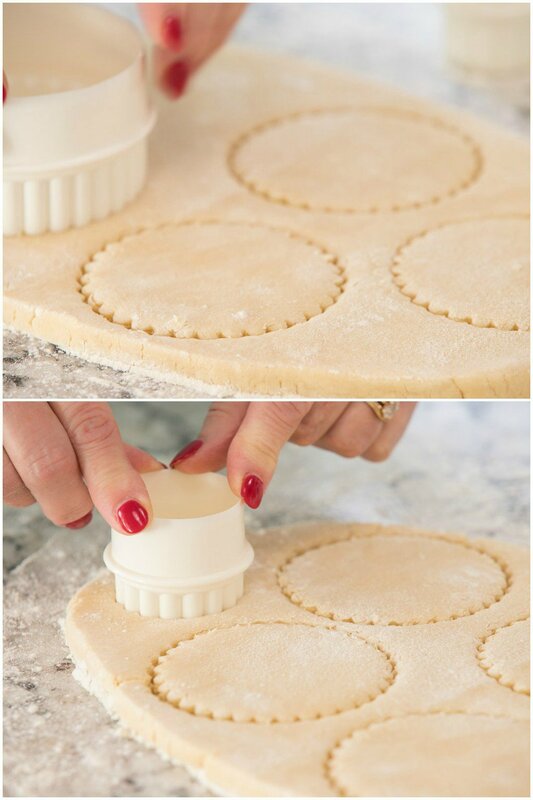 Press fairly firmly when cutting out the cookies, but don’t twist the cookie cutter as the shape will get distorted. If you don’t have room in your refrigerator to chill the cookies on two sheet pans, just place them all on one pan after cutting. Then later, once they’re chilled, you can divide them between the two pans for baking. When re-rolling the scraps, incorporate as little of the flour on the work surface as possible. Know someone who’s getting married? These cookies would make such fun wedding favors at each place setting. Put them in a clear cellophane bag and tie it with a pretty ribbon. Use the wedding colors for the piping and nonpareils. The cookies could be made weeks in advance and stored in the freezer. They come out as if they’ve never been frozen! I use these fluted cookie cutters to make my Valentine cookies. They come in a variety of sizes and have a nice storage container. These cookies are not only delicious and look like they come from a fine bake-shop, but the dough recipe is one-bowl and no-mixer! Line 2 sheet pans with parchment paper. Set aside. Place soft butter in a medium-size mixing bowl. Stir with a wooden spoon or sturdy spatula until nice and smooth. Add powdered sugar and vanilla. Mix together by hand for about 1 minute, until fluffy and well blended. Add the flour and corn starch. Stir until dry ingredients are incorporated and the dough is shaggy. Generously flour a work surface. Turn the dough out onto the floured surface and press into a ball. Knead 5-6 times times until fairly smooth, then form into a ball again and press with your hands into a flat disk. Turn the disk to coat both sides with flour. Roll out the dough to an approximate 3/8-inch thickness (see tips above in post). Keep work surface, dough and rolling pin dusted with flour. Cut desired shapes and place on prepared pans. Re-roll scraps as many times as needed to use up the dough. Place cutouts in the refrigerator for at least one hour or up to 24 hours. When ready to bake, preheat oven to 375˚F. Remove 1 pan of cutouts from the refrigerator and bake for 12-14 minutes, or until just beginning to turn golden at the edges. Rotate pans halfway through for even browning. Repeat with second pan of cutouts. Cool completely before icing. For the glaze, combine powdered sugar, half and half and extract in a medium-size bowl. Mix until smooth. Glaze should be thick, but pourable. Add a little more half and half if too thick. Taste the glaze and add more extract, if more intense flavor is desired. Transfer the glaze to a shallow bowl. 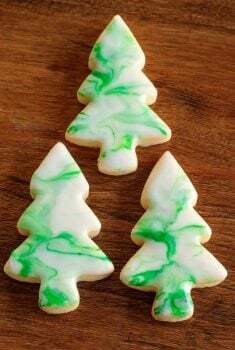 To glaze the cookies, hold onto the edge of a cookie and dip the top surface into the glaze, being sure all of the top surface touches the glaze. Pull cookie straight up and out of the glaze. Allow excess glaze to drip back into the bowl for about 15-20 seconds. When glaze stops dripping, quickly flip the cookie to the right side up and give it a gentle jiggle to allow the glaze to flow evenly over the surface. Repeat with remaining cookies. Allow glaze to dry for 15-30 minutes. For the buttercream piping, place butter in a medium-size bowl and stir until smooth. Add powdered sugar, 1 1/2 tablespoons half and half and extract and stir vigorously until smooth, adding a bit more half and half if needed to achieve a thick, but smooth consistency. Add food coloring, a drop at a time, to reach desired shade. Place buttercream in a pastry bag fitted with a small round icing tip (I used a Wilton #5 round tip). 10. 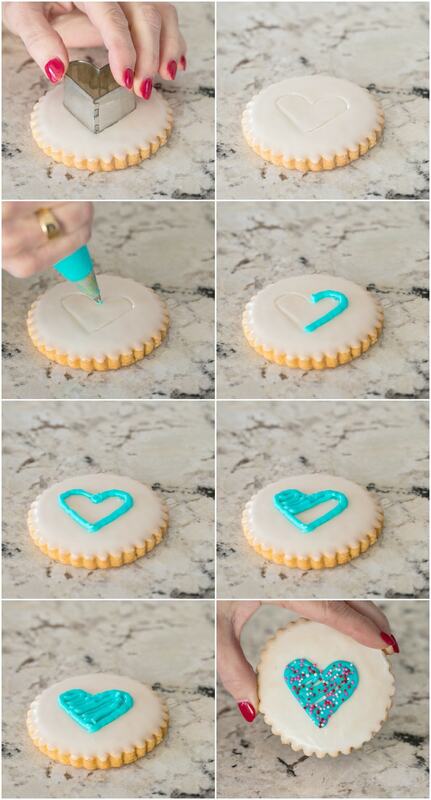 Make an outline on the top of each cookie with a small heart-shaped cookie cutter. Pipe around the outline with buttercream. Then, starting at the top, fill in the heart with diagonal, back and forth lines (see pictures above). Immediately sprinkle with nonpareils of choice. Set aside to dry. See Café Tips above for lots of extra tips and detailed instructions. This recipe makes a dozen large (3-inch) or two dozen smaller (2-inch) cookies. Great recipe! I needed shortbread cookies that wouldn’t puff or spread because I was using a custom cookie cutter with someone’s face on it. I’m happy to say the cookies turned out great and the design didn’t get distorted. I used Earth Balance buttery sticks in place of butter to make them vegan, and it worked perfectly. Thanks, Stephanie! So happy you enjoyed them! Hi Xiomara Loo, half and half is an American convenience product that is half whole milk and half cream. You could use whole milk for this recipe in its place.